This is the kind of recipe that is not a recipe. More of a guideline. 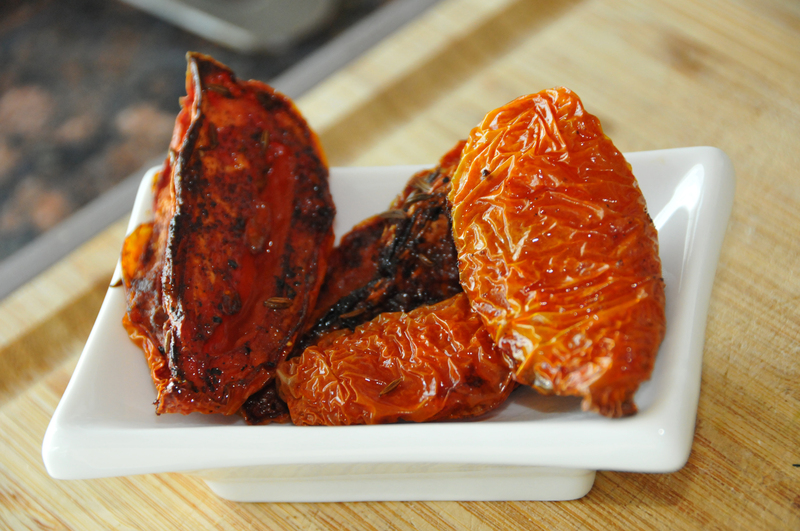 Serve slow-cooked tomatoes: crushed as a jam slathered on a burger or crostini; as-is as a finger food (my favorite! ); chopped in a salad; tossed in with grains; or with a shot of good-quality olive oil as a pasta dressing. 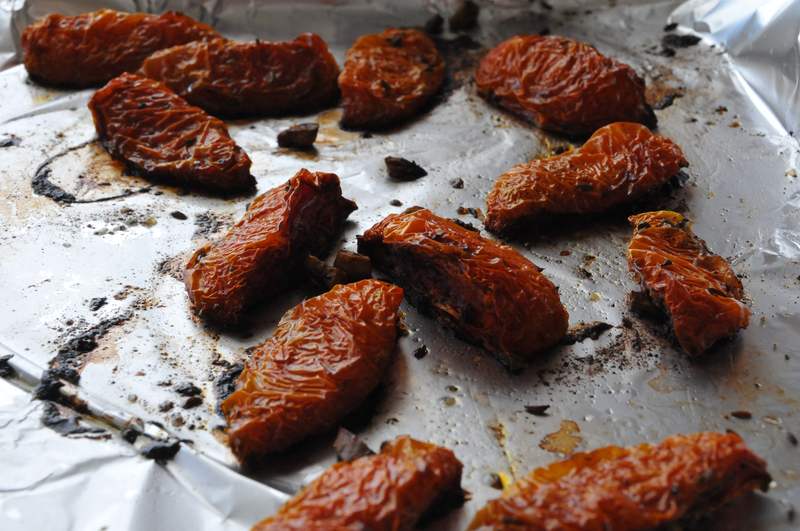 Preheat your oven to 250 degrees F. Quarter the tomatoes lengthwise and arrange cut sides up in a single layer on a foil-wrapped baking sheet. Drizzle with olive oil and sprinkle with cinnamon, caraway, salt & pepper (or other herbs and/or spices if you are so inclined). Roast for 2 hours until tomatoes collapse a little and are browning in spots. Flip over (skin side up) and roast an additional hour and a half until the skins are puckered and the tomatoes are falling apart. If any should make it to a bowl, mash with a fork or potato masher to make jam or slice for salads and pasta. If you’re like me, they may not make it that far. Variations: You can make this jam with any tomato you have on hand–I have made with slicing tomatoes, cherry tomatoes, etc., though my favorite is the Roma tomato for this particular application. You can also add brown sugar to the mix, swap the cinnamon for nutmeg, etc. This can really be dressed a thousand different ways depending on what you happen to have on hand when you notice your tomatoes are almost past their shelf life.